Thank you so much B (and B’s Nan, who this once belonged to) – she has moved into my laundry, and looks great on my sunny windowsill! prior to this twee advance in home maintenance styling, ‘housewives’ recycled tomato sauce bottles, making holes in the metal screwtop for sprinkling. 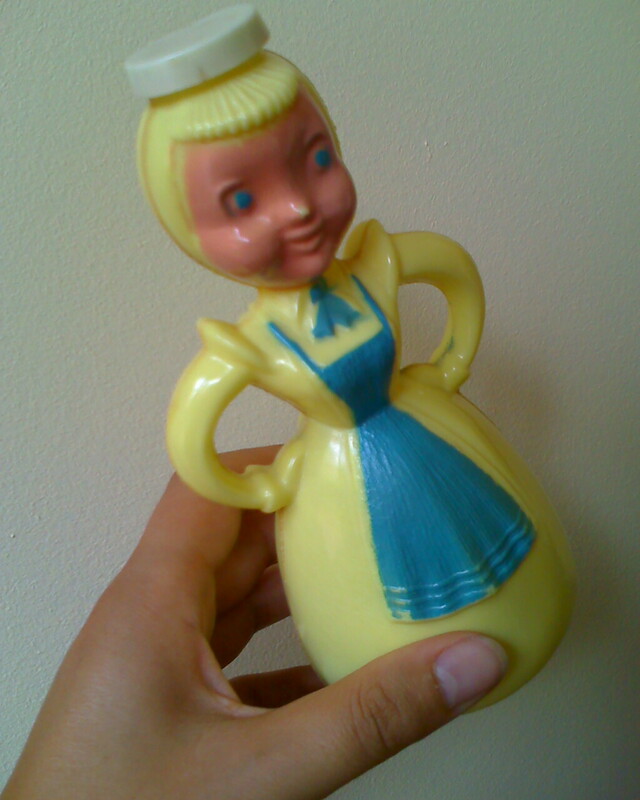 Ann O’Dyne: I saw a pistachio green one at Chapel St Bazaar last week, was tempted to buy my sunny yellow lady a friend…I remember the recycled bottles too – my great aunt K (dressmaker extraordinaire) used a waisted one that fitted nicely into the hand. never have seen one of these gals..btw: wrong season for snow?